The mid-life refresh of the Honda Pilot is a wake-up call to others selling midsize, three-row SUVs. Honda has doubled down on standard safety offerings, with Honda Sensing included on every trim line and blind spot detection effectively standard. The cabin has been gussied up with a new instrument panel and some improvements to infotainment. Honda also wants you to know this is an SUV, not a minivan, so it toughened the exterior look somewhat. You can traverse uneven dirt roads and rocky paths, a feature the Pilot already had but Honda hadn’t emphasized. If you opt for all-wheel-drive, you can tow 5,000 pounds. The only silliness with this dazzling SUV is the high-end Honda Elite, or what’s exclusive to the trim line. Honda pimped the Elite with a standard Blu-ray player and rear entertainment system (remember when that mattered?) and made Elite the only Pilot trim line allowed to provide Qi wireless charging. These frills bring the Elite to your dealer at $ 49,000-plus, or three grand more than the starting point for an all-wheel-drive Acura MDX. Thankfully, Honda chose to implement real blind spot detection, and not the offbeat LaneWatch right-side camera, for tracking the vehicle’s side blind zones. Add up the Pilot’s pros (lots) and cons, and you have the mainstream midsize SUV to beat heading into 2019. For the refresh of the third-generation Pilot, Honda kept the 280-hp V6. There’s a six-speed automatic transmission standard. The nine-speed in the top trim lines, Touring and Elite, was tweaked to be more responsive; it starts in second gear for smoother stoplight departures. Inside, the Pilot’s instrument panel clones the look of the Honda Odyssey. All but the entry model get CabinControl, a phone app to let those in the second and third rows control audio, HVAC, and the rear entertainment system if so equipped. Pilots with the latter also get CabinTalk, a front-seat-to-back-rows intercom system that pauses the infotainment while mom or dad tells the kids to behave. I would buy a Pilot in an instant if the button were labeled STFU. 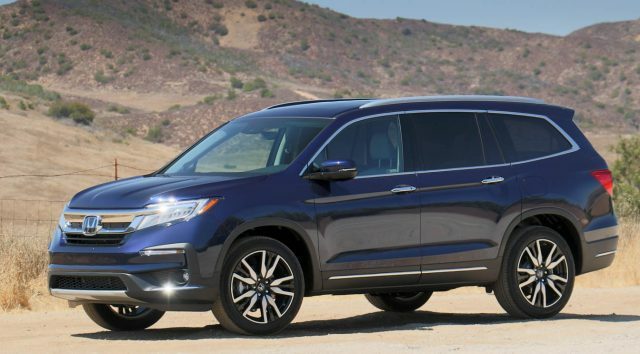 Most of all, every 2019 Pilot gets Honda Sensing, the safety suite comprising full-range adaptive cruise control, lane keep assist, road departure mitigation, forward collision warning, automatic emergency braking, and collision mitigation braking. Honda’s blind spot detection system lives outside the Honda Sensing suite, but no matter: It’s on all but the price-conscious Pilot LX that exists to have an advertised price under $ 33,000 ($ 32,445) and is only 3 percent of sales, Honda says. The range-topping Elite comes in at $ 49,105. In short: Whether you’re buying, or recommending to a friend, you know that if you go to a Honda dealer, odds are 97:3 that your chosen Pilot has every last bit of safety Honda makes available. Honda Pilot climbing a man-made hill. Honda’s off-road test track also had a bed of rocks, a steeply banked dirt curve, undulating bumps that could get one or two wheels in the air, and a dusty, high-speed sweeping turn. The new Pilot handled all of them. The second-generation Pilot looked like a brick, albeit a rugged one. The third-generation is solid, too, but “rugged” was something that didn’t stick in the minds of buyers, or so Honda claims. The test drive included an off-road course carved into Epona Estates, a manicured Southern California vineyard. It included a hill climb, steeply banked U-turn, undulating tracks that got one or (briefly) two wheels in the air, a rock crawl, and a high-speed, duststorm-inducing turn. This was not Jeep Rubicon levels of off-roading, but it’s well beyond gravel-road-to-ski-chalet off-roading that any all-wheel-drive car could negotiate. A console button shifts Pilot among normal driving, snow, sand and the like. On the hill climb (photo above), the nose blocks forward vision. You’ll wish the Pilot had a nose camera for hills, or better 360-degree surround video, but all that’s available is the rear camera now mandated in the US. Lack of surround vision on the Pilot will be a selling point for when Nissan tries to shift you to the aging Pathfinder. The Pilot also employs mechanical torque vectoring, or intelligent Variable Torque Management (i-VTM), essentially what Acura provides as Super Handling-All Wheel Drive (SH-AWD). i-TVM and SH-AWD overdrive the outside wheel around slippery or snowy turns, or whenever it needs additional traction. Honda-Acura torque vectoring is heavier, costlier, and preferable in tough going compared with electronic torque vectoring, which brakes the inside rear wheel and speeds up the outside wheel. 2019 Honda Pilot Display Audio has an 8-inch screen and supports Android Auto and Apple CarPlay. Display Audio’s lone physical knob or button: the volume control. Anyone who cites the 2019 Honda Display Audio as improved should do so with a “but.” Display Audio took Honda cars into the era of larger color LCDs with fewer buttons/knobs, plus Apple CarPlay, Android Auto and the like. The second-generation Pilot center stack had almost 50 buttons and knobs. In its sleekest instantiation on the third-generation Pilot, 2016-2018, the display’s buttons, volume knob, tuning knob, and control wheel morphed into touchable points on the 8-inch glass panel. Owners rebelled. Honda restored some of the physical features with the 2019 mid-life refresh…but it’s the volume knob only. It’s a start. I don’t like it, personally, but it’s workable once you spend time making voice commands work. Ignoring the entry LX, with its small color display and single USB jack that won’t handle Android Auto or Apple CarPlay, the more desirable trim lines — EX, EX-L (projected to be half of sales), Touring, and Elite — all have an 8-inch display, HD Radio, support for Android Auto and Apple CarPlay, three USB jacks, and CabinControl. The EX-L can be had with or without the $ 2,000 combo pack of navigation and DVD-based rear-seat entertainment (plus CabinTalk). The Blu-ray player is in the front center stack, where mom and dad can oversee entertainment for the very young. That makes the EX-L sans nav/RES the go-to car for most buyers at $ 40,655 (with freight) for all-wheel-drive, $ 1,900 less for front-drive. With Apple allowing Google Maps and Waze into the CarPlay ecosystem, there’s less reason to pay for onboard nav unless it’s dirt cheap (under $ 250). The higher trims, Touring and Elite, integrate RES and nav and put two more charge-only USB jacks in the back seat. You can’t take just navigation. You also get premium audio with 10-speaker audio (as opposed to seven), OnStar-like HondaLink telematics, and onboard Wi-Fi (a first for the Pilot). There is also wireless (Qi) charging on the Elite. The one safety feature of note offered only on upper trim line is parking sonar, standard on Touring and Elite. Actually, it’s less safety, more parking-damage-avoidance feature. 2019 Honda Pilot cockpit looks and feels good. It will have some people wondering what they gain by going to an Audi, BMW, Lexus or Mercedes. With seating for seven or eight, the Pilot is an excellent family and youth-sports (“soccer mom”) hauler. The Honda Odyssey would be better, but many people still shy away from even the best minivans in favor of SUVs. From the Odyssey (new a year ago), the Pilot uses the same or similar steering wheel, instrument panel, CabinControl, and CabinTalk. The Pilot is quieter and smoother with a better-furnished interior than the previous Pilot. Some may feel Honda gave up too much of the company’s sporty feel with the refresh so it is now the opposite of the boxy 20109-2015 Pilot. You’ll get about 22 mpg in overall driving. The EPA rates that various Pilots — front- or all-wheel-drive, six- or nine-speed automatic — at 18-20 mpg city, 26-27 mpg highway, 21-23 mpg combined. The nine-speed has a push- and pull-button shifter that takes some getting used to; it is not, as some consumer magazines claim, infuriating. Just learn to use it. The first two rows are good for adults. On the EX-L, Touring, and Elite, seats are leather, the second-row gets side-window sunshades, and a single button provides third-row access, folding the seatback and sliding the seat forward. The Pilot cargo capacity ranges from 16 cubic feet (all sets occupied) to 84 square feet (second, third-row seats folded down). Should You Buy the 2019 Pilot? The 2019 Honda Pilot is better in one significant and many small ways from its predecessor. The big thing is that all the safety a buyer could want is on essentially every Pilot you’ll look at: adaptive cruise control, lane keep assist, forward collision warning, automatic emergency braking (city and highway both), blind spot detection, and rear cross-traffic alert. Most buyers will opt for the EX-L, $ 39,660 for all-wheel-drive, $ 1,900 less without. Our recommendation is to take it without navigation because that is coupled with rear seat entertainment, mostly of interest to families with kids 5 and under. You’ll be tempted by the Touring (25 percent of sales) because of telematics, LED high beams (all pilots have LED low beams and running lights), the nine-speed automatic, premium audio, parking sonar, and a hands-free tailgate. But the Touring runs $ 2,760 more than the EX-L with navigation/RES and $ 4,760 more than EX-L without navigation/RES. A seven-passenger version with captain’s chairs is just $ 300 additional. The Elite (about 10 percent of sales) has a dual-pane sunroof and extra ambient lighting to help explain the $ 3,300 bump over the most similar Touring. AWD and captain’s chairs are standard. It’s the only Pilot with Qi wireless phone charging, as stated above, plus power-folding side mirrors, a heated steering wheel, rain-sensing wipers, and ventilated front seats. Most of those features — Qi, heated steering wheel, rain-sensing wipers certainly — seem as if they belong on the EX-L and Touring as well. Other midsize SUVs to consider include the Toyota Highlander, an aging and reasonable choice for stolid transportation with a nice hybrid variant that is about a year from a new generation; the Kia Sorento (new model for 2019); the Hyundai Santa Fe (new model for 2019); the Nissan Pathfinder; the Volkswagen Atlas; the Subaru Ascent; and a pair of two-row midsize SUVs, the Ford Edge and Nissan Murano. The three-row Ford Explorer is technically a midsize, but it feels like a big midsize even if it’s barely an inch longer than Honda’s 196.5 inches. If you value quietness, also look at the Buick Enclave, Chevrolet Traverse, and GMC Acadia. The 2019 Pilot is a solid SUV, nicely improved halfway through the current generation. It rides and handles well. Some may wish it felt sportier on the road. It has excellent cargo and towing capacity, and handles some off-roading. Spend time with the infotainment before you buy to make sure it’s workable for you. With its upscale interior, the higher-end Pilots are starting to be competitive with the likes of the BMW X5, Mercedes-Benz GLE, and — uh-oh — the Acura MDX, which gets a new version shortly.